Mungbeans are an important export crop for farmers in Australia and Myanmar. Annually Australia produces an average of 100 000 tonnes compared with Myanmar’s 340 000 tonnes. However, the production pipeline and constraints are vastly different between the two countries. Exploring these differences was an important part of this study. Viral and bacterial diseases are seen as major factors limiting yield and stability of the crop. These can be addressed through good management, research and breeding. “This Crawford Fund Award provided me the opportunity to travel to Myanmar and Taiwan to link with researchers on the current Australian Centre for International Agriculture (ACIAR) project CIM 2014/079, ‘Establishing the International Mungbean Improvement Network’ (IMIN),” said Thomas. An initiative of the IMIN is to provide better access to diverse germplasm to address key abiotic and biotic stressors causing substantial effects on yield and the resilience of the crop. While in Myanmar discussions were held about how to access and make use of genetically diverse germplasm, crossing methods, the national priority key traits for both Myanmar and Australia; and, how to incorporate disease resistance. Bacterial diseases affecting mungbeans such as halo blight have gone uncharacterised in Myanmar. This is primarily due to the limited available resources being focused on Mungbean Yellow Mosaic Virus (MYMV) which is a devastating disease affecting all Asian growing regions. “While in Myanmar I provided support to the breeding, pathology and biotechnology teams to help identify bacterial disease and developed protocols to continue ongoing surveillance of symptoms and identification. Identification of MYMV and learning about resistant germplasm will help Australia prepare for any incursions of the disease. Although MYMV has not been found in Australia it is highly transmittable and could arrive through our nearest neighbors in South East Asia. Having firsthand knowledge of the symptoms and knowing about varieties with resistance will help prevent its establishment and reduce its impact in Australia,” said Thomas, explaining the importance of his work to the Australian mungbean industry. Halo blight a bacterial disease caused by Pseudomonas savastanoi pv. phaseolicola causes losses of 30-50%, and in severe cases, when conditions are ideal for symptom development, can lead to total crop failure in Australia and China. There are currently no reports of halo blight in Myanmar and most other mungbean growing regions throughout Asia. In contrast, MYMV is the primary disease of concern affecting mungbeans in these regions. Due the severity of MYMV and its prolific nature other diseases arising from bacterial pathogens are potentially going undetected and/or uncharacterised. A primary aim of this study was to investigate which bacterial pathogens were present on mungbean crops in Myanmar. If suspected bacterial infections were identified, molecular assays would be performed to assess the variation between locations and to confirm if the causal agent is Pseudomonas savastanoi pv. phaseolicola, or some other pathogen. “I visited three of the primary mungbean growing regions in Myanmar where I collected samples symptomatic of halo blight. The regions visited were Magway, Bagan and Tatkon. In total, 30 strains of bacteria were isolated, representing approximately 10 from each region,” said Thomas. After isolation and production of pure cultures, each isolate was DNA fingerprinted using randomly amplified polymorphic DNA (RAPD) primers. DNA from each strain was extracted and stored in -40°C until a permit has been acquired to import the samples into Australia for further analysis. Sequencing of the 16S rDNA gene will provide accurate identification of the genus and potentially the species of bacteria isolated. Sharing knowledge and methods about crossing eg. when is the best time to cross and how to pick female and male buds for maximum fertility. Researchers and farmers in Myanmar benefit from this research through links to Australian institutes and researchers providing new avenues for study opportunities in Australia; by learning to identify, isolate and characterise bacterial isolates; by having DNA sent to Australia to determine species; and developing a foundation of knowledge to continue research into the effects bacterial disease have on mungbeans. Queensland benefits from this work by the development of networks with researchers and institutes to collaborate on mungbean research; enhanced knowledge of mungbean breeding and genetics which will allow better varieties to be developed faster; potential germplasm exchange such as wild varieties with novel genetics and genotypes; and early detection of diseases like halo blight or other bacterial pathogens if they are present in Myanmar. “The Crawford-in-Qld Student Award provided me an opportunity to gain experience researching in a very different social, environmental and cultural setting. 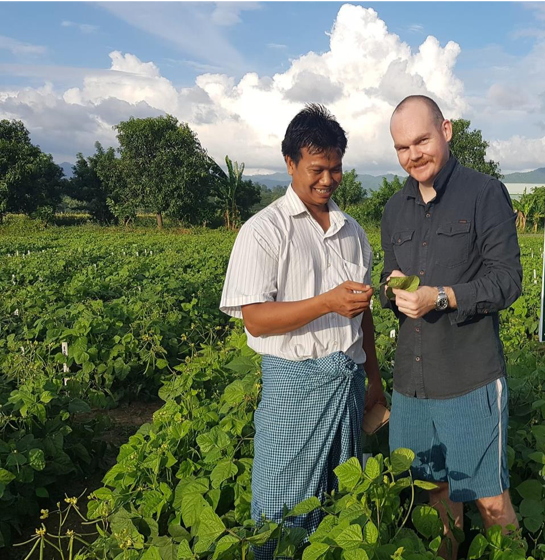 Spending an extended period of time working on the ground with the researchers and farmers allowed me to gain insight into the breeding, production and management of mungbean farms in Myanmar,” he said. “I would like to thank the Crawford Fund for providing the scholarship to travel to Myanmar where I got the opportunity to broaden and share my knowledge on mungbean pathology and breeding; Sagadevan Mundree from the Centre for Tropical Crops and Biocommodities for providing further funding to extend the trip; Col Douglas from the Department of Agriculture and Fisheries for linking me in with his networks to make the trip possible; Anthony Young from the University of Queensland for passing on his knowledge of how to identify and isolate bacterial disease; The Australian Mungbean Association for supporting the trip as a recipient of their industry funded PhD scholarship; and, The Department of Agricultural and Research in Yezin, Myanmar for hosting me and taking time out of their busy schedules to accommodate my needs from sample collection to access to laboratories and facilities,” he concluded.